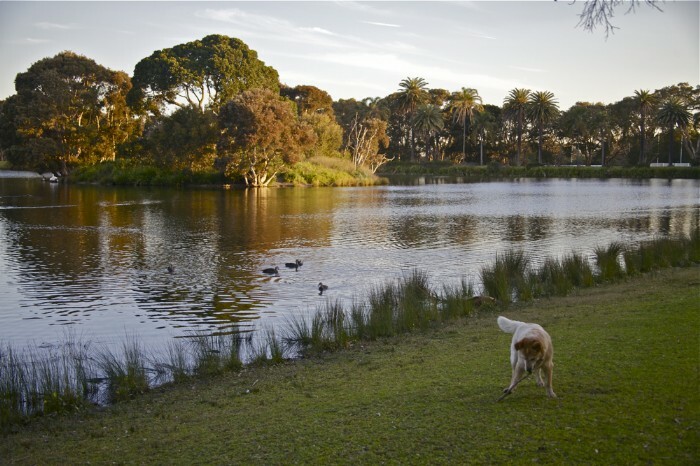 I had never known, until I just looked up Centennial Park on Google, that it was to Busby's Pond that Dad took my sister Barbara and I from our corner shop in Surry Hills. In the afternoons, when the rush had died down, he would rhetorically, and theatrically as with everything he did, ask - who wants to go to Centennial? - We both answered Instantly with a frenzy of joyful yeses. Our huge labradour Caesar would even forgo his latest culinary acquisition and bound as only a hyper-obeise lab can do towards the car ... with ponderous intent. 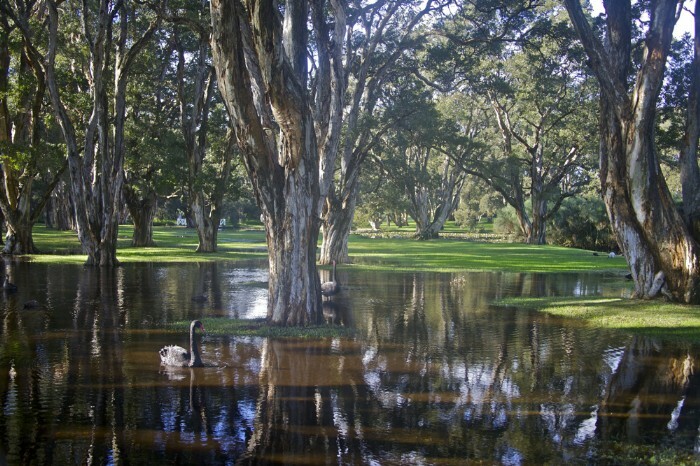 Centennial Park had been Sydney's early water supply and was then drained to become the massive expanse of green which now lies east of the city centre. It was opened by Sir Henry Parkes whose surname must have inspired the second part of its name. Among magnificent paperbarks, space, ducks in ponds and birds being chased by Caesar, I was happy. It answers the question for me, how can an inner city boy’s soul resonate with landscape as mine does? 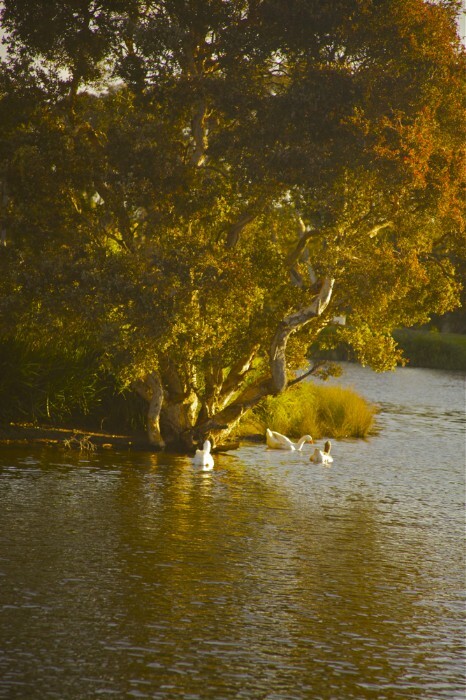 The afternoons spent in Centennial Park not just chasing ducks, but stripping off paperbark, playing with Barb and Dad, rolling around with Caesar and staring at the islands that lay in the middle of the ponds might be the answer. The joy of those afternoons associated nature in my soul with release and bliss, an imprint that grows deeper by the year. Beyond the shore of our playing area lay a mysterious island. This was the land to which I hankered, a secret world where all kinds of animals, treasure and fables lay; a magical place made even more so by never being entered. Sometimes Caesar almost made it across to this faraway planet, chasing a stick into the water. He had those big jowls that fat labs have and boy was he fat. Our customers fed him remainders of meat pies, sausage rolls, battered savs, hot dogs, half eaten sandwiches and chips. If Caesar wanted to sleep in the middle of the road he did. Cars drove around him. Mind you, Bourke Street only had a few cars a day back then. Ours was one of them, each couple of years a lovely new-car smelling Holden, one time a pink one. Must have been on special. Tommie and I walked the park yesterday and it has remained as it was intended, the People's Park. People ride on cycles and on horses. They run and stretch in lycra or practice Tai Chi in red silk. Children are handed bread to feed the ducks and are as excited as Barb and I were. Memory almost has a scent of its own. In this place it is so thick I am on the brink of convulsing with love for my Dad and for things past. Tommie chased a duck into Busby's pond. It scampered toward the little island to which my imagination made so many forays. Fifty years later the island will be named today in honour of all the other islands I have strived to explore. Hi Raymond, love reading the swagman. Good to see you out doing the things you love. Congrats on becoming a grandfather too, you'll love it! All the best. Cheers Libby. And you on becoming a Mother. I love that "Memory almost has a scent of its own." Thanks Raymond. Only in special places like this. Raymond- your words and photos are a wonderful way to start the day, providing nurture for a slightly bruised souls. Thanks for sharing your gift with us! Morning Sally. Well thank you. It is an interesting process this eSwag thing. I am continually looking for connections which is a healing thing in my own life. Bloody hell .. POPS .. I'll probably get to like it. Now here is a thought that I have had for a long time. While I think travel might broaden the mind, a bit like a pancake, I don't see much evidence that it deepens it. Going back to the same place and sinking deeper each time immerses me in a place. You have the same experience. Thats probably why you always camp at the same spot under 'your' tree at Ipolera. I understand. I must say I think of you as Silvia when I reply. Great depth and warmth in your images Raymond. Did you know that the eels in these lakes escape down drains and channels to Botany Bay then swim to seas off New Caledonia to spawn then find their way back to their Centennial Park home. They cope with both fresh and salt water. Truely amazing wildlife in the city. Hi Helen. So good to have a scientist Swagger. Now that is incredible. We used to try and spot the eels from the shoreline. Little did we know they might have been preparing for such a journey. They were such happy funny days,seems like yesterday. Do you remember taking the old vegemite jars, tying string around the neck, filling them with bread and waiting for them to fill with tadpoles? We usually got a motza crop and we looked after them lovingly till they all died! Whenever we go to Centennial, I still see two little urchins and a big fat dog having the time of their lives. Funny, I am a bit hazy on that Ray. What I can remember is having to play cricket with you at Centennial and bowling for hours till you magnanimously declared at 100, you than bowled me out first ball and we started all over again! Your cricket hating sister..
All in a good cause. I could have played for Australia.. I didn't but I could have if you'd been a better bowler. They're such amazing photos, who'd have thought they were taken right in the middle of a bustling city? I don't live too far from there and yet don't go.�I have been promising myself to have some riding lessons and I now will, after reading this blog. Thank you, Raymond. See you soon. You have done it again Raymond. Moved me to tears...and also loved the banter with Barb! Very funny. Oooh and the scent of memory... just gorgeous. Hey Loobs. You will meet Barb at the Book Launch. She is great even if she is primarily responsible for an neurotic tendencies that MAY exist in my psyche. Best wishes for a new life entering yours. Now thats a lovely idea. Thank you for it Lynn.